For a healthy glow without exposing your skin to potentially harmful UV rays, try sunless tanning airbrush sprays. You can choose the shade of airbrush tanning spray you want, whether it's a deep bronze tan or a light golden glow. These sprays can be easy to use and are non-comedogenic, so they're formulated to not clog your pores. 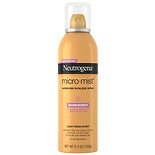 Choose from different shades of sunless tanning airbrush products for your whole body from Neutrogena or L'Oreal. To care for your skin, you can use a sunless tanning spray that contains skin nourishing vitamins. You won't have to worry about greasy residue with most sunless tanning airbrush products, since many are oil-free. Simply spray them on for an even, natural-looking tone. If you're going to be spending time in the sun, protect your skin with your choice of sunscreen. You can find sunscreen lotions, sprays, gels and more forms that work best for different activities or skin types. Choose the SPF you need, whether it's 4 for a natural tan, or 100 for total protection. Other SPFs are available, as well as formulas for sensitive skin and those for children and babies.